So a deal site popped up for this KitchenAid multicooker. I've been meaning to get a slow cooker for a while, and after checking the details of this guy, along with the rest of the stuff it does, I went for it. 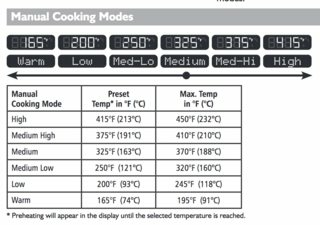 So my question is, to you slow cooking maestros, what setting should I be using to have "Slow Cook - High" equivalence? Looking at the table you've added, your "Low" is not far off a slow-cooker on high. It's just short of boiling but bubbles a bit from the hottest parts. You appear to be able to override the temperature upwards a little anyway. Slow cookers are based on power input rather than temperature control and expect the ambient temperature to be that of a typical room. I pointed my IR thermometer at mine after a few hours of cooking; the outside of the crockpot a few minutes after I removed it from the outer unit was at around 90°C. Unfortunately this was just out of curiosity and I didn't keep notes. What's still not clear is where that temperature is measured -- if it's the temperature of the air surrounding an inner pot, the food will take a very long time to reach that temperature. In that case you should probably start at a higher temperature for a little while. The recipe book for your cooker may have more details. Not the answer you're looking for? Browse other questions tagged slow-cooking or ask your own question. Is it okay to slow cook sausage casserole without pan frying the sausages?